You will be given a reference e-book to read which has 180 pages And the test will be based on that e-book , you can take final test within 1 year of purchase. Relationship management is an advanced form of customer service management, and which dynamics and synergy of relationships are factored into the equation. Relationship managers handle the various tasks of monitoring, controlling and governing customer service systems, as well as staying on top of the dynamic between people both inside the department and between the department and customers. What differentiates this from traditional customer service management is the priority given to the integration of relationship dynamics therein. Most companies have migrated from traditional customer service management methods to using the more inclusive and people friendly methods of relationship management over the course of the past 30 years. A relationship manager has quite a few responsibilities on their plate. Not only must they stay on top of the dynamics of customer service – crisis response, diplomacy, and to some extent even marketing – but they must also have a deep understanding of the chemistry between people. This includes managing the interactions between team members within their department, so that everybody clicks perfect late and the job is done. Going further, a relationship manager’s understanding of social behavior comes into play when placating upset customers, or maintaining positive, diplomatic relationships with said customers. Ultimately, this is a field where set in stone mathematics must coexist with Chaos theory. However, a skilled, well-trained relationship manager will be on top of these, and will make the and dance together as perfect partners. This is an increasingly sought after profession, as more and more companies migrate from archaic customer service management systems. However, unlike some other on the rise business fields, relationship management is not one unique business philosophy or methodology, but rather just a new take on combining to fields of interest. Therefore, a relationship manager will always have their own personal formula for success when plying their craft. This is a rewarding field, although it requires professionals who can work well under pressure. As the demand for expertise in this field continues to increase, it will continue to open up the job market, providing a multitude of employment opportunities that will exponentially increase in years to come. On top of this, a successful, it's yelled relationship manager can almost always count on job security with a stable company. If someone is interested in entering this exciting field, they can't just go knock on a door and ask for the job. Contrarily, they must first obtain a customer relationship management certification. The best channel through which to do this is online certification. Busy professionals can at long last improve their learning without sacrificing their private or professional lives to whirlwind class schedules and costly tuition fees. Online certification allows professionals to study and learn by their own schedules, and a significantly lower price than a traditional classroom environment. It's important to point out, though, that there are many online certification providers. Therefore, one must choose wisely which provider they obtain their online certification through. 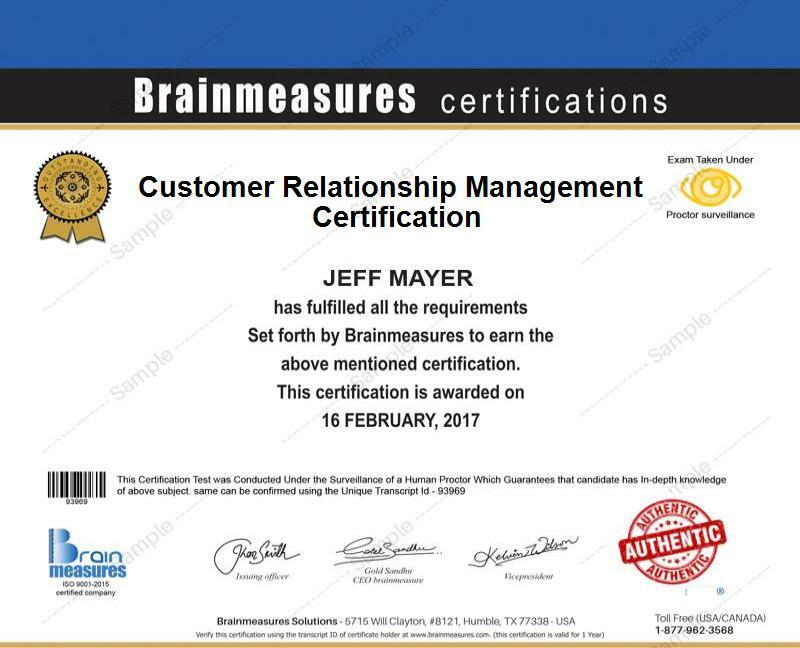 Brainmeasures has reached the absolute pinnacle of online certification excellence. This is because we go above and beyond standard requirements for the designing of our online courses. How do we do this? Simply, when we work closely with experienced, skilled professionals in a field, we take extra measures to incorporate their experience along with their inclusive knowledge. This gives our students an edge over those who choose the competition. Not only do our students have the most inclusive knowledge of a field we teach, but they also have inherited experience in the field by proxy of the professionals who helped us craft the course. This certification consists primarily of our customer relationship management course. Upon completing this course, the student must pass our customer relationship management exam. Upon passing this relationship management exam, they are rewarded a certificate. This certificate signifies that they have completed a high-quality customer relationship management certification. This course has been carefully designed so that those who have a love for people and management, and who are willing to put forth the effort, will be able to pass this certification. While this certification opens up many employment opportunities, those already in a profession they enjoy may still stand to benefit professionally from this course. The salary range for many of these positions starts out, at entry-level, around $90,000 a year. However this is a field of rapid promotion, and most find themselves earning between $317,000-$478,000 a year, within two years of employment.